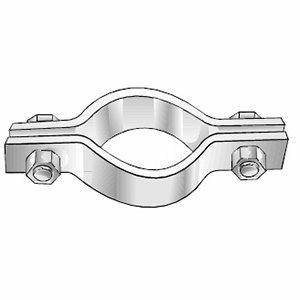 Series 550 Single Bolt Pipe Clamp #550 – 1240 550 – 1240 1 1/4 inch 24 inch 5/8 inch 3 inch Carbon Steel 3060 lbs. 2730 lbs. Series 550 Single Bolt Pipe Clamp #550 – 1300 550 – 1300 1 1/2 inch 30 inch 3/4 inch 4 inch Carbon Steel 4000 lbs. 3520 lbs. Series 550 Single Bolt Pipe Clamp #550 – 1140 550 – 1140 7/8 inch 14 inch 1/2 inch 2 inch Carbon Steel 2490 lbs. 2220 lbs. Series 550 Single Bolt Pipe Clamp #550 – 1160 550 – 1160 7/8 inch 16 inch 1/2 inch 2 1/2 inch Carbon Steel 2490 lbs. 2220 lbs. 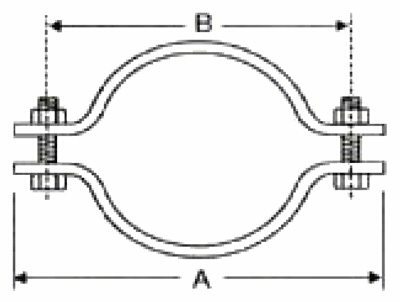 Series 550 Single Bolt Pipe Clamp #550 – 1180 550 – 1180 1 inch 18 inch 5/8 inch 2 1/2 inch Carbon Steel 3060 lbs. 2730 lbs. Series 550 Single Bolt Pipe Clamp #550 – 1200 550 – 1200 1 1/8 inch 20 inch 5/8 inch 2 1/2 inch Carbon Steel 3060 lbs. 2730 lbs. Series 550 Single Bolt Pipe Clamp #550 – 140 550 – 140 5/8 inch 4 inch 3 gauge 1 1/4 inch Carbon Steel 1040 lbs. 930 lbs. Series 550 Single Bolt Pipe Clamp #550 – 150 550 – 150 5/8 inch 5 inch 3 gauge 1 1/4 inch Carbon Steel 1040 lbs. 930 lbs. Series 550 Single Bolt Pipe Clamp #550 – 160 550 – 160 3/4 inch 6 inch 3/8 inch 1 1/2 inch Carbon Steel 1615 lbs. 1440 lbs. Series 550 Single Bolt Pipe Clamp #550 – 180 550 – 180 3/4 inch 8 inch 3/8 inch 1 1/2 inch Carbon Steel 1615 lbs. 1440 lbs. Series 550 Single Bolt Pipe Clamp #550 – 1100 550 – 1100 7/8 inch 10 inch 1/2 inch 2 inch Carbon Steel 2490 lbs. 2220 lbs. Series 550 Single Bolt Pipe Clamp #550 – 1120 550 – 1120 7/8 inch 12 inches 1/2 inch 2 inch Carbon Steel 2490 lbs. 2220 lbs. Series 550 Single Bolt Pipe Clamp #550 – 114 550 – 114 3/8 inch 1 1/2 inch 11 gauge 1 inch Carbon Steel 800 lbs. 715 lbs. Series 550 Single Bolt Pipe Clamp #550 – 120 550 – 120 1/2 inch 2 inch 3 gauge 1 inch Carbon Steel 1040 lbs. 930 lbs. Series 550 Single Bolt Pipe Clamp #550 – 124 550 – 124 1/2 inch 2 1/2 inch 3 gauge 1 inch Carbon Steel 1040 lbs. 930 lbs. Series 550 Single Bolt Pipe Clamp #550 – 130 550 – 130 1/2 inch 3 inch 3 gauge 1 inch Carbon Steel 1040 lbs. 930 lbs. Series 550 Single Bolt Pipe Clamp #550 – 134 550 – 134 1/2 inch 3 1/2 inch 3 gauge 1 inch Carbon Steel 1040 lbs. 930 lbs. Series 550 Single Bolt Pipe Clamp #550 – 104 550 – 104 3/8 inch 1/2 inch 11 gauge 1 inch Carbon Steel 500 lbs. 445 lbs. Series 550 Single Bolt Pipe Clamp #550 – 106 550 – 106 3/8 inch 3/4 inch 11 gauge 1 inch Carbon Steel 500 lbs. 445 lbs. 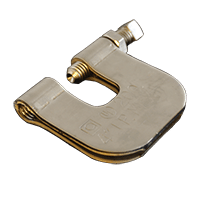 Series 550 Single Bolt Pipe Clamp #550 – 110 550 – 110 3/8 inch 1 inch 11 gauge 1 inch Carbon Steel 500 lbs. 445 lbs. Series 550 Single Bolt Pipe Clamp #550 – 112 550 – 112 3/8 inch 1 1/4 inch 11 gauge 1 inch Carbon Steel 500 lbs. 445 lbs.